When I found the recipe for the Moroccan Chicken the other day, I immediately started wondering what to serve with it, in addition to the obligatory couscous. That's when I came across He Cooks, She Cooks, who had also tried the recipe and served it with a carrot and fennel salad as a side, which I thought sounded like a great idea and solved my quandary perfectly. It's been a while since I last made carrot and fennel salad, but here's my version. Whisk together honey, vinegar, orange juice, and olive oil. Add carrots, fennel, green onions and mint and toss to coat. Season to taste with salt and pepper and stir in the toasted sesame seeds. Leave in the fridge for a couple of hours before serving for the flavours to develop. Mmmmm...Fennel! This salad looks quite refreshing. This looks delicious. I am always on the lookout for carrot salads. Oh wow colorful and yum. Sylvie, this is so funny! 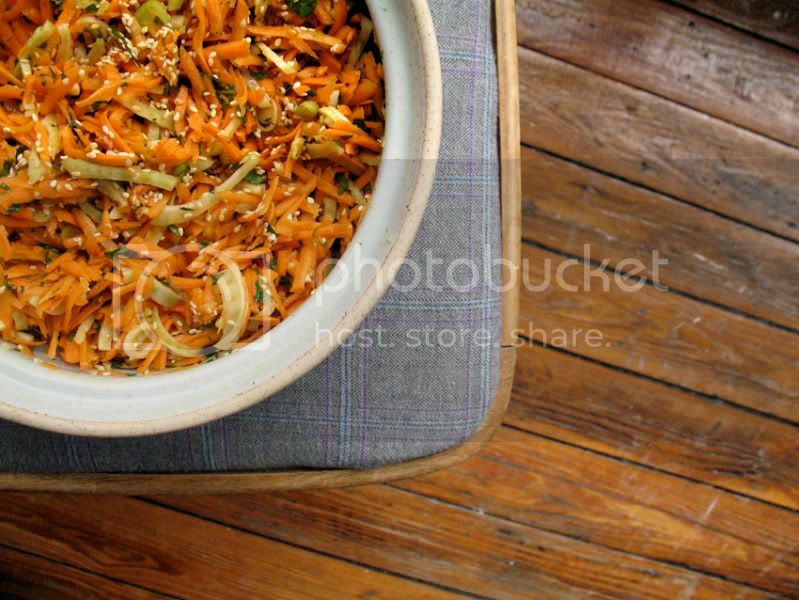 I posted a carrot and fennel salad today as well! I just love fennel. It is just perfect in a salad and yours looks splendid! Carrot and fennel are made for each other, great dish it looks really tasty. this looks really nice,,, i only ever eat carrot raw and so do my kids and i am a big fennel addict - how come i have never through of combining these? will try very soon! Great combination of flavors. And it would go so well with the Moroccan chicken. I may just go buy my own chicken to roast. Along with some fennel and carrots. There's some really interesting flavours in this, it looks wonderful! I really like the sound of orange, mint and honey, among those other ingredients in the salad. I haven't made anything with fennel since the Algerian slaw that night with the chicken, but I can imagine yours being really nice for summer. If fennel wasn't so expensive, I'd get it a lot more often. It was great to meet you today. This salad sounds just delicious - exactly what I would have liked to eat when I got home after my marathon train journey. I'll be eating it for lunch tomorrow instead. Chelsea, I like fennel too and don't use it often enough. Kitchenette, I never used to like carrot salad until a few years ago. What was wrong with me? Val, the flavours did match well. Kitchen flavours, I love food that looks colourful and fresh like this. Nora, thanks. I hope you'll come again now that you've discovered it. Jeena, you're right the two go really well together. the passionate cook. I'm sure you'll like the combination. Eralda, do! I'm sure you'll enjoy it. Brittany, this is great for summer and to take along to BBQs and picnics as it keeps so well. Naomi, it was so nice to meet you to. I'm glad you survived your marathon journey home. Celine, my train ride wasn't bad at all. Quiet and on time. What more can you ask for? It was lovely to meet you and I hope you made it back home okay as well. This healthy salad looks really delicious!! !